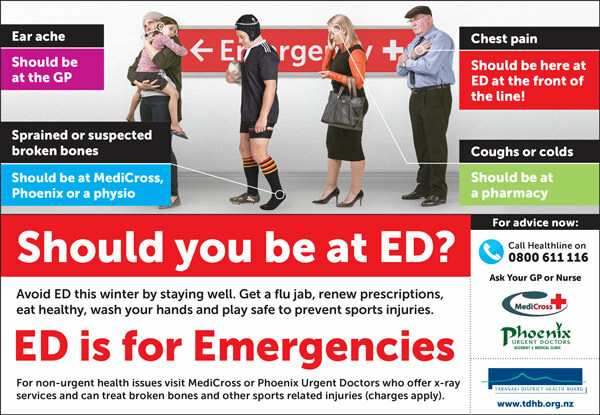 With winter illnesses and sports injuries adding to the workload at Taranaki DHB’s Emergency Department (ED), an awareness campaign called ‘Should you be at ED?’ has been launched to help educate the Taranaki community about what is considered an urgent and non-urgent health issue. The campaign features people with common health issues that regularly turn up at ED. “For symptoms like ear ache, coughs and colds you can call Healthline (0800 611 116), visit a pharmacy or see your GP. For injuries like sprained ankles and suspected broken bones you can visit MediCross or Phoenix who offer x-ray services, treat broken bones and other sports injuries,” said Mrs Crowe. Taranaki DHB has used a number of different strategies to promote the campaign, including radio ads, a moving billboard on the back of a bus and cinema advertising.